Hi everyone! 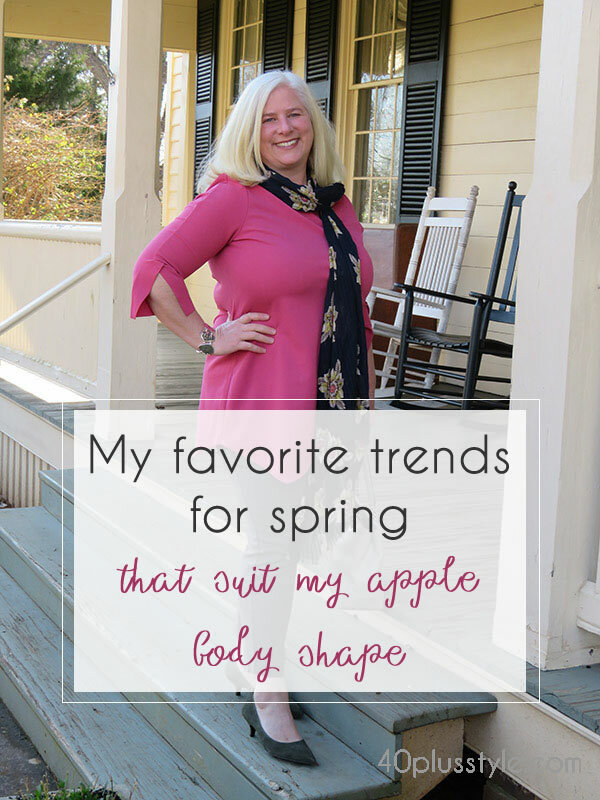 As I’ve been looking at the new spring trends and the items coming into the stores, I’ve found a couple of trends that I think will look great on the apple-shaped woman. It has the elastic at the hem which gathers the fabric and should end just below your tummy. It blouses out for all sizes, so it’s expected, and it can really hide your tummy and any lumps or rolls in your midsection. This will be a good item for the warmer months, because it is an easy style to wear without having to top it off with a jacket, sweater or vest. Also check our guidelines on how to dress for the apple body shape. I find the best bottoms to wear with these type of tops are something that’s tighter, like leggings or heavier fabrics, like denim. The elastic hem can grab and wrinkle up a light fabric or a skirt that flows outward. This pencil skirt works because it’s tighter fitting and is the heavy ponte fabric. Here is the exact same top I’m wearing above, but in plus size and here in tall size. 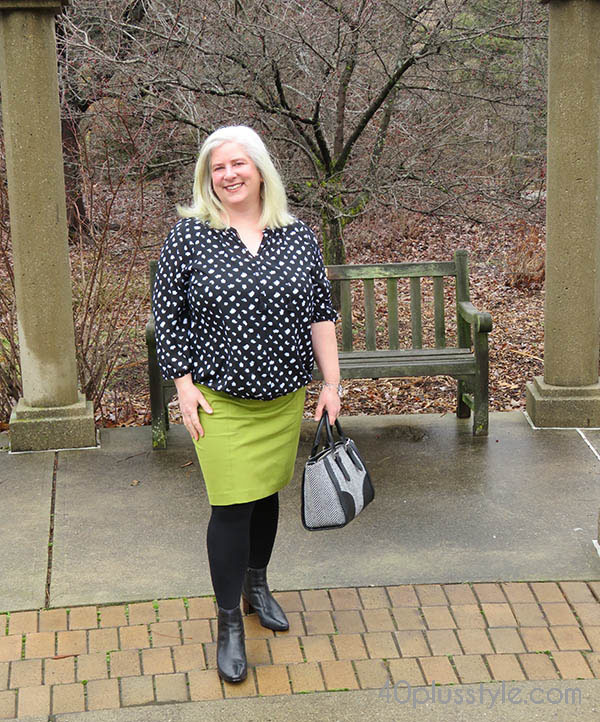 I am wearing my ever faithful pencil skirt too that you can find here but in some other springy colors here and in pretty patterns here. I tried them on with hesitation afraid I would look short and stout. The width of the pants balances out the width on top. I found it’s best to show some ankle and wearing a bit of heel with an open vamp (the top of the shoe) is the most flattering. If it’s still chilly where you live, I found tall boots look really cute with the wide-legged pants too. So, they could easily be pants you wear year-round. I actually end up wearing lots of pants this time of the year. I love my skirts and dresses but have such a conundrum about wearing tights or bare legs. I usually just stick with pants until my legs are ready for the exposure! I start with ankle length pants with a bare ankle then move to cropped pants. I also start opting for more open footwear like pumps or flats. This helps me get geared up for bare leg season. Also check how to wear wide leg pants. And can we just talk about sleeves? They have so many fun styles of sleeves out there, that even if the rest of your shirt is pretty standard you can freshen up your wardrobe with those fun sleeves. Watch out for the ones though that look like they’ll drag in your lunch or get caught under your keyboard! I like the ones that end at 3/4 sleeve length or at the elbow. That way you can have the style but it’s still functional. The asymmetrical hem is still on-trend and is a fun way to freshen up your tunics. Imagine, you could probably wear several trends in one item with a fun-sleeved, asymmetrical tunic. Also check the best shops for the apple body shape. I can tell you the trend I’m staying away from this spring — ruffles. The ruffles at the hem of the shirt does nothing good for the apple-shaped woman and the ruffles up around the neck and bust just add more fabric where we have our own natural curves without having to add more visual interest! I find spring to be the second hardest season to dress for behind summer. With the warmer temperatures, you usually want to start losing layers and getting less bundled up, but might not be ready to expose that much skin. You can still use layers, just lighter fabrics and an open, summery shoe will go a long way towards making you feel more ready for spring. Even just lightening up your colors will make you feel more springy. I know you can find a great outfit that you will look and feel great wearing and will put a spring in your step! What is your favorite trend for spring this year? Great job Julia. You exceeded yourself (again). 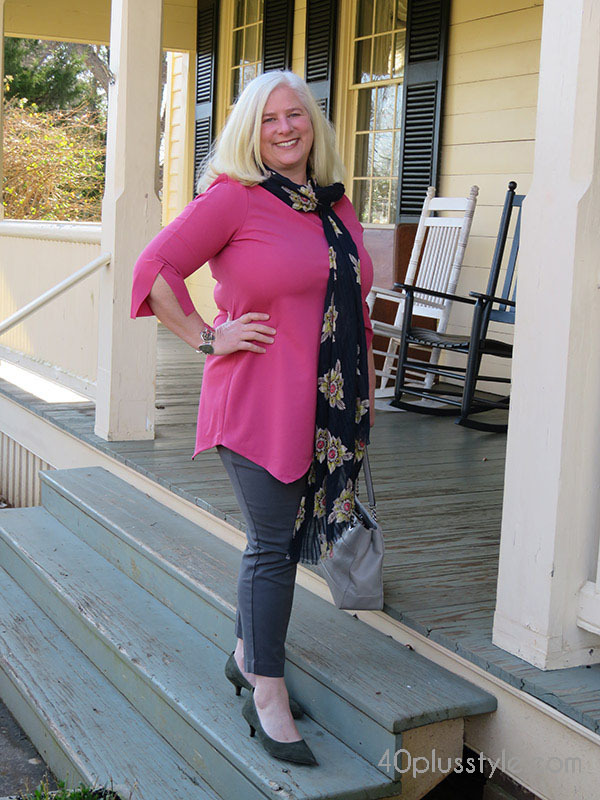 That pink(ish) top with the fun sleeves and the clever scarf… looking like a million dollars. Kudos. Now, dig me up someone like you (with your styling sense) but with an inverted triangle shape, 5ft 74 and a D-cup. I will read and reread every article. Thank you Greetje! So, now to dig someone up who looks like that….! Thankyou Julia, wonderful tips and advice, my favorite was your pink top and jeggings, the patterned top with bright green skirt was super fun and you looked very elegant in the cropped pants. Thanks Ally! For my shape, I find leaving a bit of ankle showing really is flattering. My ankles are one of my favorite parts though, so that may be why! Great article and outfits Julia. I love how you put a long scarf with the pink tunic.